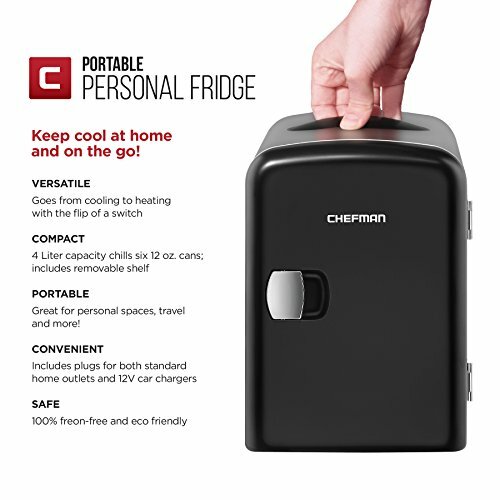 The Chefman Portable Personal Fridge and Warmer keeps your food and drinks the perfect temperature while at home and on the go. 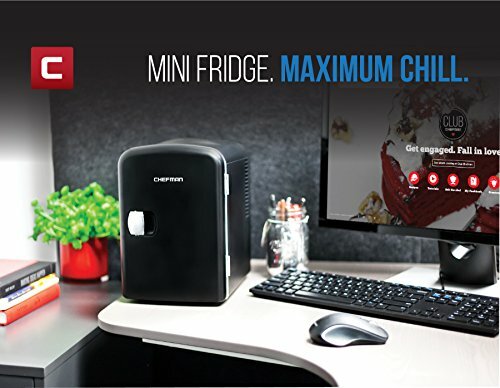 The ultimate versatile cooler, this mini fridge goes from cooling to heating with just the flip of a switch. Cools up to 32°F below ambient temperature, and warms up to 140°F at an ambient temperature of 75°F. 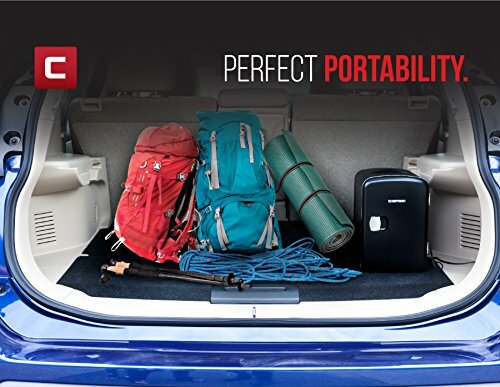 Compact space saving design and lightweight features make it easy to take with you anywhere, yet can still fit your needs; 4 Liter capacity chills six 12 oz. 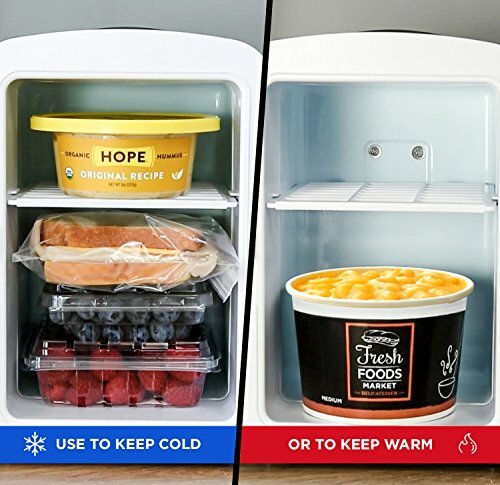 cans, while a removable shelf makes it easy to store milk, juice, yogurt, bottles, smoothies, cheese, fruit, coffee, soup, and many more home cooked meals or beverages. Perfect for personal spaces, bedrooms, offices, hotels, boats, carpools, soccer games, sporting events, backyard BBQ, pool parties and more! Conveniently plugs into standard home outlets and 12V car chargers so you can take with you anywhere you go. 100% Freon-Free and Eco-Friendly and cETL approved with advanced safety technology for long-lasting durability. Make the most of your purchase with access to Club Chefman for tailor-made step-by-step recipes, tutorial videos, and more! 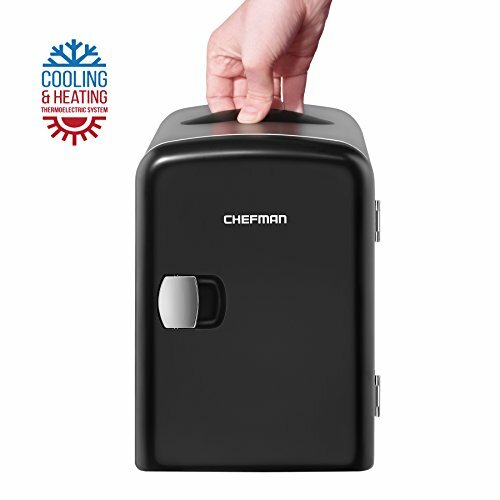 30 Day Money-Back Guarantee, & 1-year hassle-free warranty provided by Chefman. 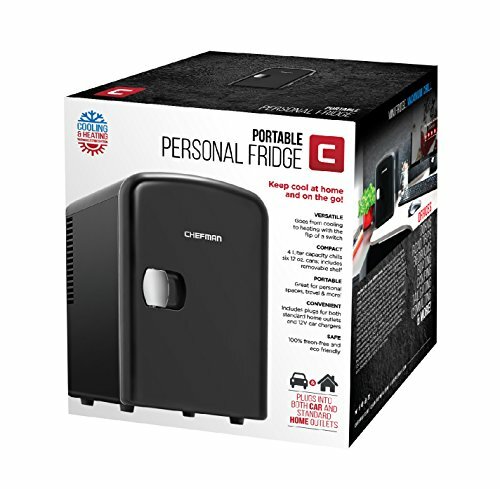 Cooling and warming on-the-go has never been so easy!PERFECT PORTABILITY: Great for personal spaces, travel, offices, dorms, road trips, boating, camping, tailgating, commuting, and more!